While remodeling my daughter’s bedroom 15 years ago, I came across a piece of news paper stuffed in the wall. 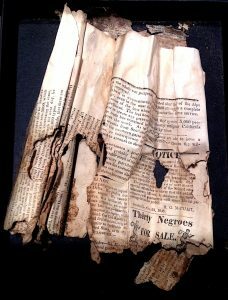 It read 30 Negros for Sale in Scottsville, VA, 1848. As I held the news paper , the realization of what happened became more real. Holding this paper took me back to that terrible time. Even more Scottsville is where I live now. WOW! This year as I thought about a new piece I revisited the news paper which I saved. Here is what I created. A large framed panel, 54 in. x 44 in. covered in lead. The writing is sandblasted into the lead. A cross which is 2.5 in deep and covered in lead, houses the paper surrounded by raw cotton. I used non-glare glass to seal everything air tight. The cross is framed in a gold rope frame of wood. I really love this piece and dedicate it with love and respect to all those who suffered.